This inexpensive Four Barrel Metal Money Coin Changer has proven to be the most reliable and indispensable change maker around. Excellent for waitstaff, concessionaires, ice cream vendors, and other businesses where a high volume of change is necessary but a register may not be readily available. 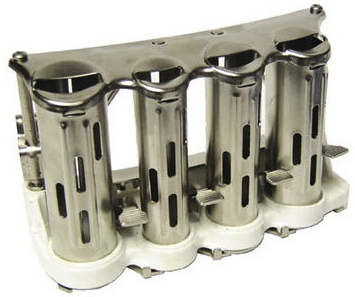 Tubes are constructed of nickel plated steel with a tough plastic housing. Rear slide hooks attach easily to a belt for convenient access. These coin changers are set to dispense one coin at a time from any one of the four barrels which hold various coins: 38 quarters, 37 nickels, 56 dimes and 49 pennies.